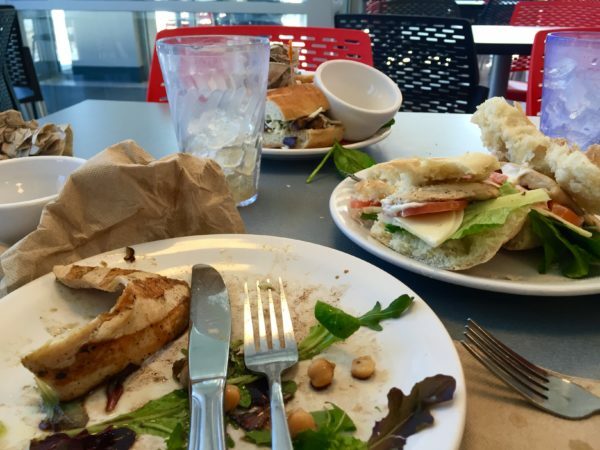 If you’ve ever left a dine-in facility on campus, you’ve probably come across a scene that should be infuriating to any environmentally-conscious consumer: plates and plates and plates full of food, often completely untouched, destined for the dumpster. It’s different every day. Sometimes it’ll be a freshly tossed salad piled high with leafy greens, tomatoes, eggs and other items. Other times it’ll be a half-eaten or nibbled-at burger, or entire slices of pizza and bowls of pasta. The question is, why? Why are we routinely dumping this food we’ve paid for? It’s important to understand the consequences of this frequently-ignored phenomenon. Food waste is exactly what it sounds like: the disposal of food without consumption. In the U.S., 30 to 40 percent of food produced is wasted, dumped in landfills, rendered useless during processing, or even left in huge piles in the middle of the desert, according to the United States Department of Agriculture. Naturally, this is a colossal waste of resources, as every ounce of labor, water, energy and land used to produce this food is rendered pointless when it’s not reaching families (and hungry Seawolves) who need them. The USDA estimates that 133 billion pounds and $161 billion worth of food was lost this way in 2010 alone. To add insult to injury, all of the food wasted this way is going to decompose and produce methane, a greenhouse gas that, pound-for-pound, can warm the Earth 25 times more than carbon dioxide over a 100-year period. The Washington Post reported that global food waste produced an equivalent of 3.3 billion tons of carbon dioxide emissions in 2007, accounting for 7 percent of all greenhouse gas emissions, surpassing the total emissions of some countries. These emissions trap heat in the Earth’s atmosphere, raising the global temperature. Food production (and food waste) has only ramped up since then, making food waste even more threatening to the environment. Some of this waste is excessively pointless. Contrary to popular belief, food labeling in the U.S. isn’t standardized and can be extremely misleading. NPR reported that a carton of eggs could still be perfectly safe to eat three to five weeks after the printed date on the box. Then there’s the fact that public perceptions of what our food should look like have led producers to dispose of perfectly edible food if it doesn’t match specific aesthetic criteria, creating even more food waste that is expanding our landfills, polluting the air, wasting resources and leaving people hungry. Stony Brook has at least tried to mitigate this effect by composting pre-consumer waste: the clippings, skins and other parts of the food that aren’t served and would otherwise be more trash for the landfill. A poster on the back wall of West Side Dining states that the school composted 100,000 pounds of pre-consumer waste last semester. The compost was transferred and used in the Research and Development Park’s greenhouse, cutting down on the equivalent of 190,000 pounds of greenhouse gases that would have been released if it was simply thrown out with the trash. But it’s nearly impossible to practically compost post-consumer waste at Stony Brook’s dining halls, as oils, meats, citrus peels and other common foods can’t be composted, and these are often mixed in with food. Hence the responsibility falls on students to reduce the impact we’re leaving on the environment, the economy and other people by being mindful of not wasting food. I don’t know why students are throwing out entire plates of untouched food. Maybe they’re late for a class and weren’t watching the time. Maybe they got indigestion. Maybe they just think it tastes bad and can’t stomach the thought of taking another bite. It’d be wrong to condemn them all for factors I may or may not be aware of. But I implore you all to mind what you’re eating on and off campus and do your best to finish your plate. The environment and the economy will thank you for it.